Q: Fashion photographer, by day, David, I’m sure you can appreciate the irony with me, and many, I’m sure, wondering how in the world a fashion photographer started shooting portraits of young women baring their scars from confronting breast cancer? A: It’s very ironic isn’t it? I actually never intended to shoot The SCAR Project. It began very organically seven years ago after my dear friend Paulina was diagnosed with breast cancer. She was 29. Within two weeks she’d had a mastectomy. A beautiful, strong, young woman, I had taken Paulina’s picture a hundred times since she was 17. Months after her surgery, when she finally returned to our yoga class, her leotard clearly defining the space where her breast has been I knew I had to take her picture again. I took her picture because, perhaps as a photographer, taking pictures is my way of confronting, understanding, and accepting the things I see. When I began doing this, I was simply dealing with my own pain in watching my friend’s suffering. I had no idea what was going to happen and how much it would grow and evolve over the years. Q: How is Paulina now? A: She is happily married with 2 children, living peacefully on a large farm in Australia. Q: Are you still shooting SCAR portraits? How many have you shot to date? A: I began shooting The SCAR Project in 2005 with Paulina . . . then her friends from chemotherapy wanted their portraits taken . . . and I have not stopped. Nearly 100 young women have been photographed so far. They journey across the country—and the world—to have their portraits taken and to participate in The SCAR Project. There are 35 large-scale portraits in the exhibition, and 50 pictures in the book, The SCAR Project: Breast Cancer is Not a Pink Ribbon. The book is available on Amazon. There are many more images on The SCAR Project web site. Q: Will there be a second book? Q: Why do you continue shooting new subjects for The SCAR Project? When will, or will, the project ever be complete? A: The SCAR Project in general is photographically complete. I do still add images occasionally but these days they tend to be reserved for some of the most unfortunate (very aggressive, extremely time sensitive) situations. So with that in consideration….until there is a cure, I suppose it may never be fully “complete”. Q: What is your goal with The SCAR Project? A: Presented primarily an awareness raising campaign for young women, The SCAR Project’s deeper message is one of humanity. The acceptance of all that life offers us . . . all the beauty . . . all the suffering too . . . with grace, courage, empathy, and understanding. Ultimately, The SCAR Project is not about breast cancer, but the human condition itself; the images intend to transcend the disease, illuminating the scars that unite us all. Q: You have been shooting fashion photography for over 20 years. During the SCAR Project shoots, has there been a moment that has particularly caught you off guard, maybe shocked you with its backhanded beauty? Can you share one of those unforgettable experiences in shooting The SCAR Project? There is something about photography that’s very real. We’re so accustomed to seeing ourselves in a mirror but that reflection is actually reversed. A photograph isn’t. That’s why it’s often shocking to see yourself in a photograph—it’s not what you see in the mirror every day. It’s what everyone else sees. In that moment, Sarah came face to face with herself. She’d had a double mastectomy in her mid-20’s. It was shocking for her. Q: The pictures are shocking for many to see. Not many photographers deal with hard subjects like breast cancer. How do you approach such a difficult subject, and the women bearing their scars, with your camera? A: I struggled shooting The SCAR Project. I was torn. I wanted the pictures to be raw, honest, and sincere. Yet I knew why the subjects had come—they wanted something beautiful. They had already suffered greatly and although I wanted to serve them, I knew in my heart that compromising the visual integrity of The SCAR Project for the sake of easily digested beauty would serve no one. Certainly not the people I hoped to be impacted by the images, the public at large who remain blissfully unaware of the risk or reality of the disease . . . anesthetized by pink ribbons and fluffy, pink teddy bears. Q: Which brings us to the tagline . . . “Breast cancer is not a pink ribbon” . . . Are you against pink ribbons? How and why did you choose this tagline? A: Hundreds of thousands of people have viewed these images and I have yet to meet anyone who has said they previously knew what breast cancer looked like. Really looked like. In our society breast cancer is hidden away behind a little pink ribbon. The public needs to be educated. Many women dislike the pink ribbon. They resent the commercialization of breast cancer that it represents. One of the SCAR Project subjects said to me, “If a man got prostate cancer, do you think someone would give him a pink t-shirt and teddy bear?” It (unintentionally) diminishes something that is terrifying, disfiguring, and deadly. Q: There’s a fine line between awareness and fear. Your portraits show beautiful young women confronting this terrifying, disfiguring, and deadly disease. How do you maintain this balance in your photography? Do you feel like The SCAR Project maintains this balance, or does it cause unnecessary fear? A: Breast cancer is the leading cause of cancer deaths in young women ages 15-40. Fear is unnecessary but awareness and education are extremely necessary. The SCAR Project participants range in ages from 18-38 and represent this often overlooked group of young women living with breast cancer. Q: The SCAR Project exhibition premiered in NYC in 2010, then traveled to Cincinnati and back to NYC again in 2011. What has been the public’s response to the images and The SCAR Project? Have you received many complaints about the exhibition being uncomfortable to view? A: It can be uncomfortable for the viewer. It forces us to confront our fears and inhibitions about life, death, sexuality, sickness, relationships, etc. I once read it described as “unflinching.” Reality is not always pretty. This is reality. Let’s address it. The SCAR Project presents an opportunity to open a dialogue about issues we are not necessarily comfortable with. From the overwhelming responses we’ve received at the exhibitions and on the Facebook page, though, it’s a very necessary dialogue these young women have been bold enough to begin, because this is the absolute reality young women surviving cancer are dealing with every day. Q: The SCAR Project captures so many different women at various points in their journeys of confronting breast cancer, with different choices made, different scars, different realities. Some women, like Paulina, have only one breast. Some women have been shot before or have chosen not to pursue reconstruction. Some women bare their reconstructions, the good, the bad and the ugly. With the way society values, idolizes beauty, is our society prepared to see beauty in images like yours? A: When I first began shooting The SCAR Project I didn’t know if anyone would want to look at the pictures. I didn’t care and shot them anyway. Seven years later and I think I have an answer. I think society is not only prepared for images like this (and what they represent) I think they are starved for it. When The SCAR Project Exhibition premiered in NYC no one walked by the gallery without coming in. Thousands of people came in. It was like a beautiful, heart wrenching magnet. There are now more than 26,000 people on The SCAR Project’s Facebook page. Millions have gone to its website. A documentary about it: “Baring It All” premiered on the Style Network in July 2011, and has since been aired around the world, was recently awarded a 2012 daytime EMMY. Q: You brought up the very next question–The EMMY–How was that experience for you and filmmaker Patty Zagarella? What is it like to own an Emmy now? A: It’s still quite surreal! I’m still looking for a big enough gold chain so I can wear it around my neck! But in all sincerity, I have Patty and her team to thank for making such a beautiful documentary. We were beyond humbled and thrilled to have such recognition for the film and for The SCAR Project. Q: So many women, both subjects of The SCAR Project and viewers have come to you and said that the images have changed their lives: given them the will and strength to fight for their life, renewed their relationships with their friends, significant others, and most importantly, within themselves. What is it like to hear that? A: It is not possible for me to convey how deeply humbled I am that the images of The SCAR Project have impacted them so deeply. It is difficult for me to respond. I prefer to let the girls speak. I am only a vehicle, a medium that allows them to expose their truth. That’s all that is going on. On some level I am just a terribly empathetic person who is able to catch a glimpse of the subject’s soul through the camera, the soul of a woman in this case. The soul of humanity—that’s what I’m trying to capture . . . to catalyze that in the subject . . . and push the button in that moment. Q: You can’t take these pictures and not be affected by the women and their stories. We can’t view the images and not catch a glimpse of what inspired you from behind the camera lens. Can you share one of the women who have particularly inspired you beyond the lens? A: One woman who will always be very special to me is Jolene. Jolene was diagnosed with breast cancer when she was 17. Jolene took a bus across the country, from California to NYC to be photographed for The SCAR Project. She was 18 at the time. Unfortunately the cancer returned, having spread throughout her body. It was particularly aggressive, and relentless, having spread to her jaw, which they had to remove and try to reconstruct. A tumor then grew near her skull, pressing on her brain and causing her to have strokes. She asked me to take her SCAR portrait again. I flew out to California to photograph her. It was a beautiful but emotionally difficult shoot. Jolene was on a journey, which we knew, unless something drastically changed, was going to end relatively soon. She was in a wheel-chair, and basically on home care. The disease had completely transformed her body and life. Knowing that it would be the last picture I would ever take of her. It was a very poignant moment. Jolene was to be the guest of honor at last year’s SCAR Project exhibition in NYC. She had spent her final months and days looking forward to attending, as friends from all over the country were trying to help her make one last wish come true. Unfortunately, Jolene was not well enough to make the trip and she passed away Oct. 30, 2011. But despite all of this, Jolene was one of the most inspiring women I have ever known. She was courageous, compassionate, and loving. It’s a reminder to us all to be present, to be grateful for what we have . . . even if it appears to be little. She reminds us . . . educates us . . . showed us . . . how it is not only possible but so important to both live and die with beauty, grace, and dignity. Q: What has it been like for you, not just as a photographer, but as a human being, to have documented, photographically, subjects like Jolene until their death? A: I seem to have a different perspective on life and death. That does not discount the reality that their paths, like Jolene’s, and now Vanessa’s, are very disturbing. However, I find a certain peace within the construct of death. And though there is no peace in a young girl dying, I suppose I’m trying to express my own perspective–that there is a serenity and acceptance … To me, death is the easy part. The hard part is living. And because I have that perspective, I strive within my work . . . within my given days, to attain not only peace in my own life . . . but to hopefully share and inspire the same in those I come into contact with . . . no matter how briefly. Also, most people don’t have the luxury of knowing they’re dying, and just as it may appear to be a tragedy…it’s only a tragedy for those that are left behind. Obviously cancer is a terrible way to live, as well as to die, but “living sincerely”, and living in every moment as if it’s a gift that could be taken away at any moment, (as Vanessa has done and continues to do until her death), is what it’s all about. In a way, the knowledge of her impending death has ignited a will to live…to truly LIVE, as fully as she possibly can. And she is trying to show us how we can do that, too, with The Live Sincerely Project. Q: How has shooting The SCAR Project evolved you, as a photographer and personally? A: The things that can seem so unbearable, the things that seem like the absolute worst thing that could ever happen to you will absolutely be the best thing that has ever happened to you . . . if you allow it. We as humans tend to procrastinate doing the things we need to do in life. We put things off, look the other way, surrender to our insecurity and fears. But Mother Nature will always have her way with us . . . forcing our hand . . . forcing us to live up to our own true potential. You can choose to live up to it . . . or die mired in it. This I know for sure, both from my own life and from photographing these women. Q: This brings up yet another mysterious and fascinating aspect of you. Your understanding of beauty. You have a very sexual yet elegant style to your fashion photography, and ultimately it is beautiful; you capture the flawless sexuality of a woman. And yet, within The SCAR Project photographs, of young women who have lost their hair, lost their breasts, you capture equally poignant beauty within those photographs too. In your fashion photography you capture a visual image of beauty, and with The SCAR Project you capture a visual image of beauty from the inside out. Usually a photographer can do one or the other end of the spectrum. Do you ever think about that? Is it challenging to go from one to the other? A: Never. I honestly do not see a distinction between the two. It’s all the same. I shoot the women for SCAR in the same way I shoot fashion. And my insecurities and doubt as to whether I got a good shot are the same with both. Every single time, I want to throw down the camera and give up. I am convinced that anyone, ANYONE, could take a better picture than me. 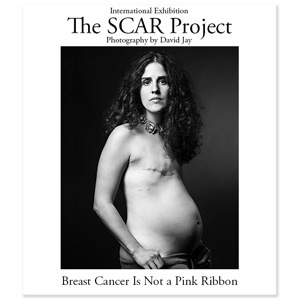 The SCAR Project is not about taking beautiful pictures of women with breast cancer. I’m not going to just show half the story—that everything’s going to be fine and these girls have breast cancer but the will just go on with their lives—because that’s not the case. I wish that was the case but the reality is that some of these girls are dying and it’s important to have their story out there as well because that is the reality of the disease. As difficult as it is to look at the portraits in the gallery, it’s important that they are there. Q: Besides The SCAR Project and your day job of shooting fashion photography, anything else on the horizon for David Jay? A: We are currently working on a dual exhibition to premiere in Birmingham, Alabama this January. The Alabama Project began earlier this year after someone told me about a young woman named Leah, living in Alabama. Her story is compelling not only because of her young age, but also due to her struggle with health insurance and the effect it was having on her fight with breast cancer. I quickly discovered that there were several more young women in the area with very similar struggles and I knew it was a subject I wanted to address (and stories I wanted to tell) photographically. Whereas most of The SCAR Project images are very portrait-like in nature, I wanted The Birmingham Project to be more documentary in its style. I wanted to capture these women throughout their day-to-day life: from the hospital room, to the MRI room, to their living room. The time I spent with them in Birmingham was a very special and eye opening experience. Their generosity in allowing me to step into their personal lives was incredibly moving. Here were young women in their 20s, fighting not only a terrifying disease but facing the additional struggle of finding and sustaining the proper healthcare to help them in their fight. And yet despite their challenges, what was most profound during our time together, was seeing a common thread of faith, perseverance and beauty. A love of life in every one of them. And in addition to The Alabama Project, I have begun shooting what I like to call “SCAR Project 2.0”, The Unknown Soldier. Very similar to The SCAR Project, The Unknown Soldier will focus on young men and women (under 30 years old) who have survived severe/disfiguring injuries in the Afghanistan war. I recently shot the first picture for The Unknown Soldier, a 27 year old marine named Michael Fox. Our time together was incredibly special and I have a feeling this next photographic journey will be an incredible one.